I dug up the garden. Now when the zombie apocalypse comes, my family will STARVE! Love, Cecely. Posted July 21st, 2013 . She was just trying to help you with your harvest! Walking Dead doesn’t come back til Oct. Replant quick! Shame on you! And who will then feed you?? I don´t think you have thought it through. 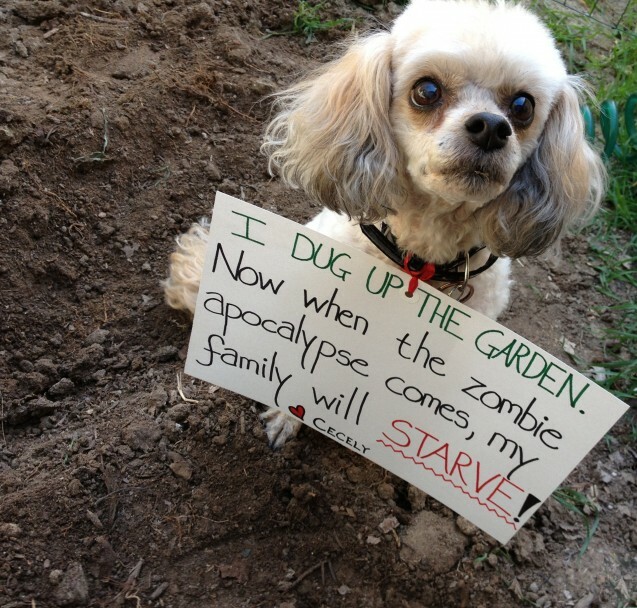 Zombies eat little dogs too! lol Cute dog. How we love them. Ohhh but look at that sweet, sweet face and big soulful eyes. What an angel. I think she was framed. It was the neighbor’s cat, I’m certain of it.